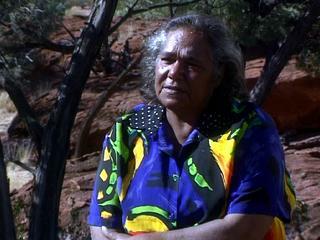 Video clip synopsis – Rosalie Kunoth-Monks is an actor, ex-nun and Aboriginal activist. Broadband MP4 kunosoc_bb.mp4 (4.4MB), suitable for iPods and computer downloads. Rosalie Kunoth Monks – Social Work is an excerpt from the program Rosalie Kunoth Monks (26 mins), an episode of Australian Biography Series 4 (7×26 mins), produced in 1995. Rosalie Kunoth Monks Until the age of nine, Rosalie Kunoth-Monks lived on remote Utopia Station in the Northern Territory where she learnt the Aboriginal laws of her tribe, the Amatjere people. In 1953 she was discovered by filmmakers Charles and Elsa Chauvel and won the lead role in Jedda, a film that became an Australian classic. Later, Rosalie spent ten fulfilling years as a nun in a Melbourne convent before leaving to set up the first Aboriginal hostel in Victoria. She has continued to be active in social work and politics and as a campaigner for her people. Australian Biography Series 4: The Australian Biography series profiles some of the most extraordinary Australians of our time. Many have had a major impact on the nation’s cultural, political and social life. All are remarkable and inspiring people who have reached a stage in their lives where they can look back and reflect. Through revealing in-depth interviews, they share their stories – of beginnings and challenges, landmarks and turning points. In so doing, they provide us with an invaluable archival record and a unique perspective on the roads we, as a country, have travelled. Australian Biography Series 4 is a Film Australia National Interest Program. Rosalie Kunoth-Monks was the lead female actor in the first Australian full-length colour feature film, Jedda (dir. Chauvel, 1955), which for her was not a good experience (see her comments online in the Australian Biography Kunoth-Monks video clip titled, Jedda). From the beginning of her working life, Rosalie knew her future would involve helping people. Rosalie expected to find opportunities to help people within the Anglican convent, the Community of the Holy Name where she became an ordained nun. However, after 10 years she left because of a sense of alienation. Describe the type of work Rosalie was doing as a liaison officer in Victoria. What was her specialist area of professional training? Explain what Rosalie was responsible for being the first to institute when she was working with the Victorian Ministry of Aboriginal Affairs. Discuss in class first then plan and write five diary entries about the experiences of an Indigenous liaison officer such as Rosalie Kunoth-Monks, visiting a community to get to know the local population and to assess the people’s needs.